This week I continued with my drawing and watercolor practice. 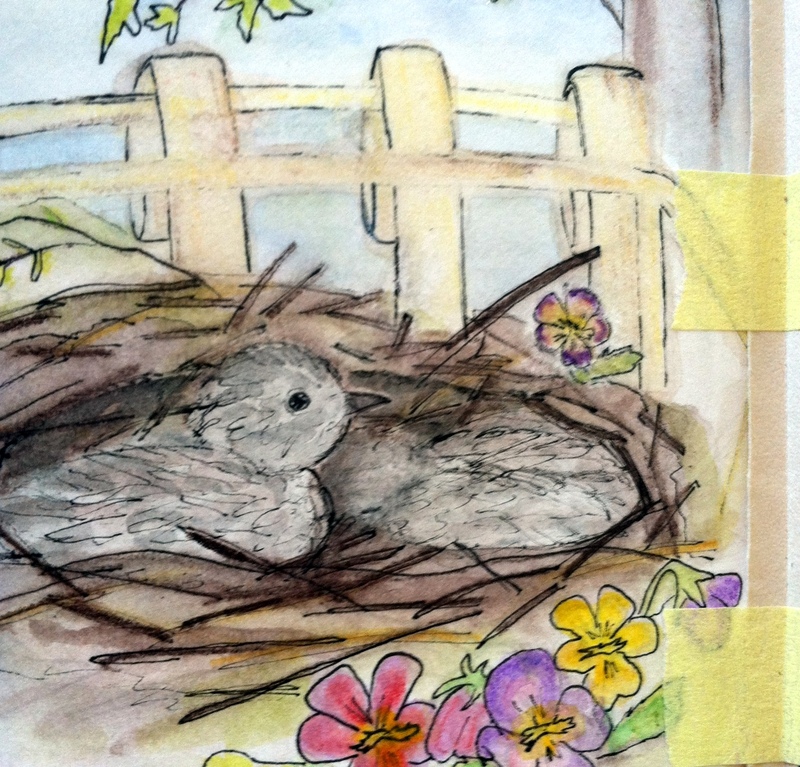 Sketching baby Mourning Doves, born in a planter on our balcony last week, I tried to capture their downy little bodies tucked in their nest. I am not sure my watercolor techniques are improving but I am really enjoying experimenting and would eventually love to find a local class. 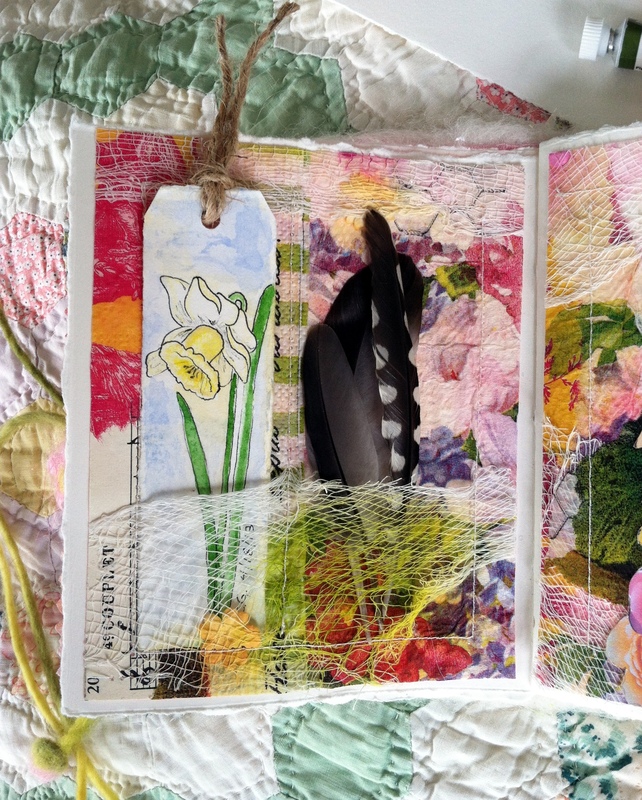 After I finished my sketch the existing adjoining page was far too vibrant for my liking so I tipped in a part of a vintage birthday card from my ephemera collection. 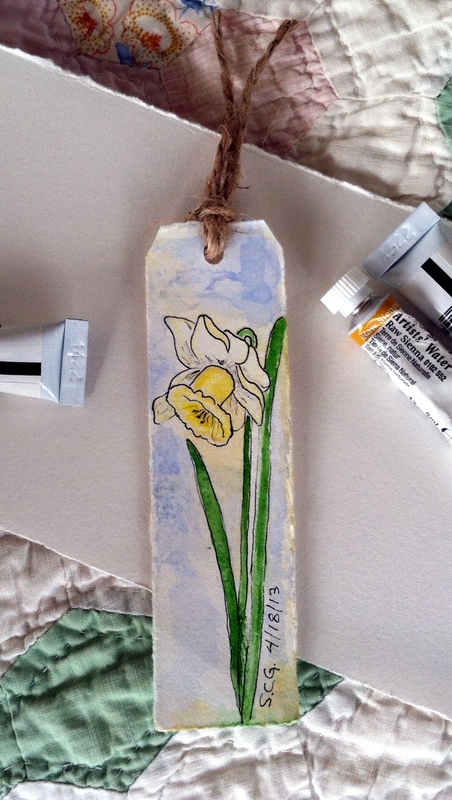 Surprised at the striking resemblance of the pansies depicted on the card to the pansies I had painted, even down to the color and placement, I decided it was meant to be! 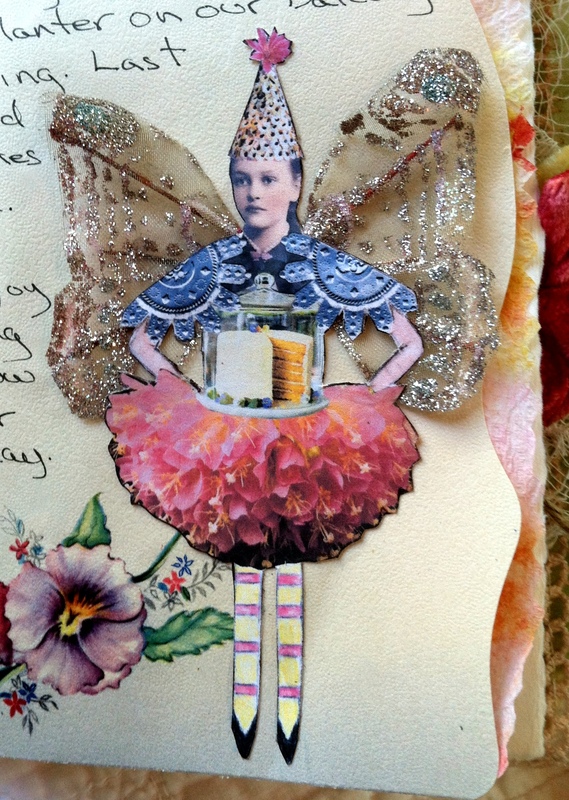 After attaching the card with a few strips of pale yellow Washi tape I had on my worktable I used another of my collage images adding glittery butterfly wings I found on the sidewalk and a few journal lines. 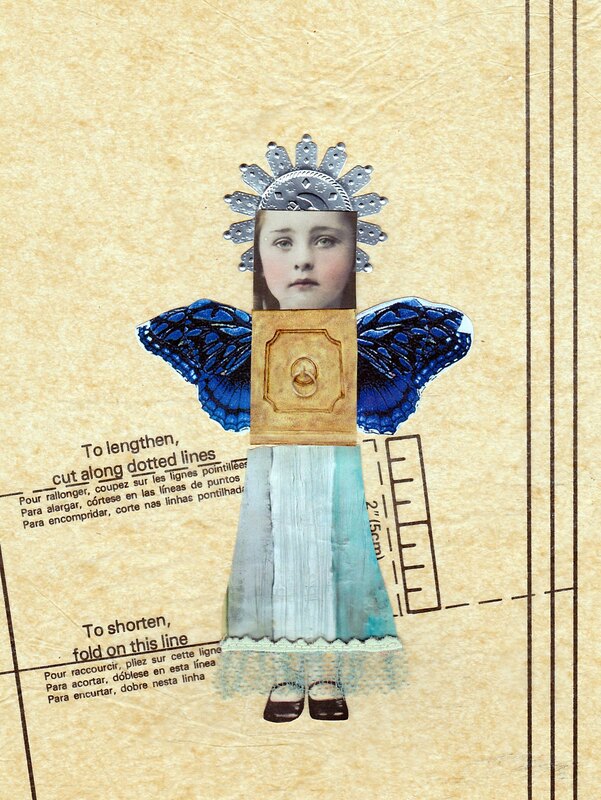 The pretty face I used is from Paper Whimsy, the epaulettes are an ornament cap flattened and cut in half. 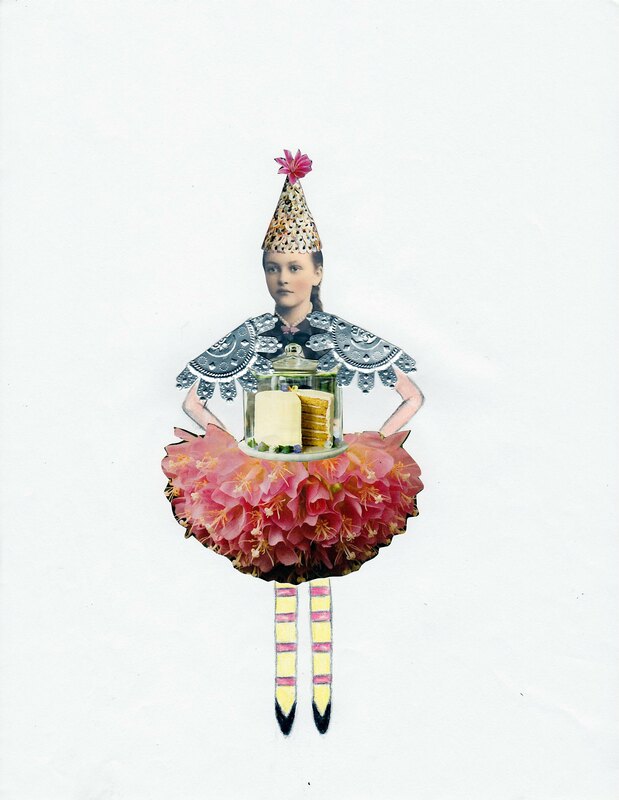 Her skirt and pompom are cut from garden catalogs and the cake dome and her party hat (an upside down wall sconce) are from a home decor magazine. I sketched her arms and legs. 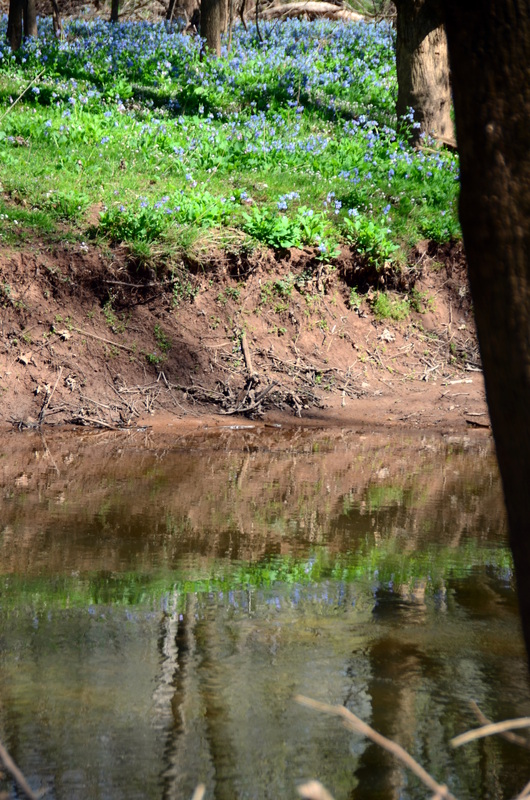 I did a little research and found that free-living doves live between 7 and 11 years of age. However, banding research confirms a longevity of much longer than that. The Mourning Dove is actually one of the 10 longest lived free-living species in the Bird Banding Lab Database, holding a record of 31 years and 4 months! I hope our sweet little Mourning Doves have many more birthdays! 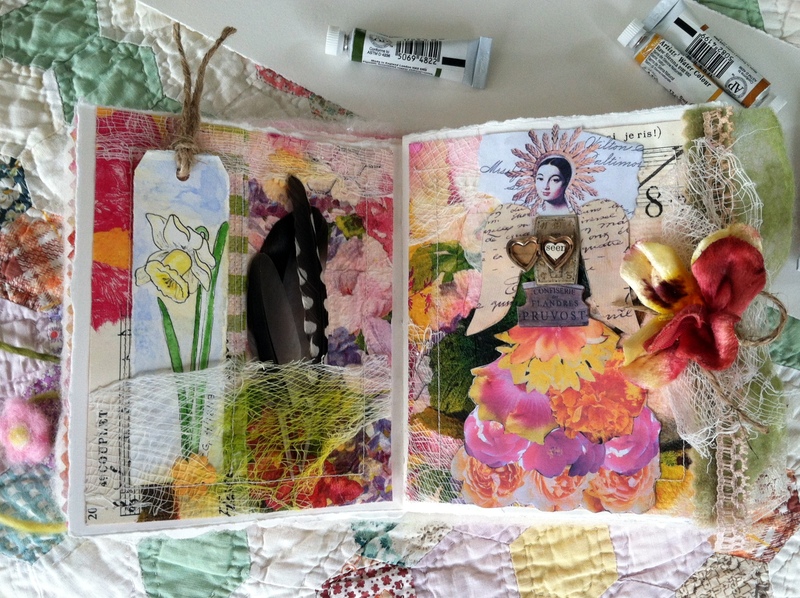 I enjoyed making a second journal spread this week still working with my recently collaged images. 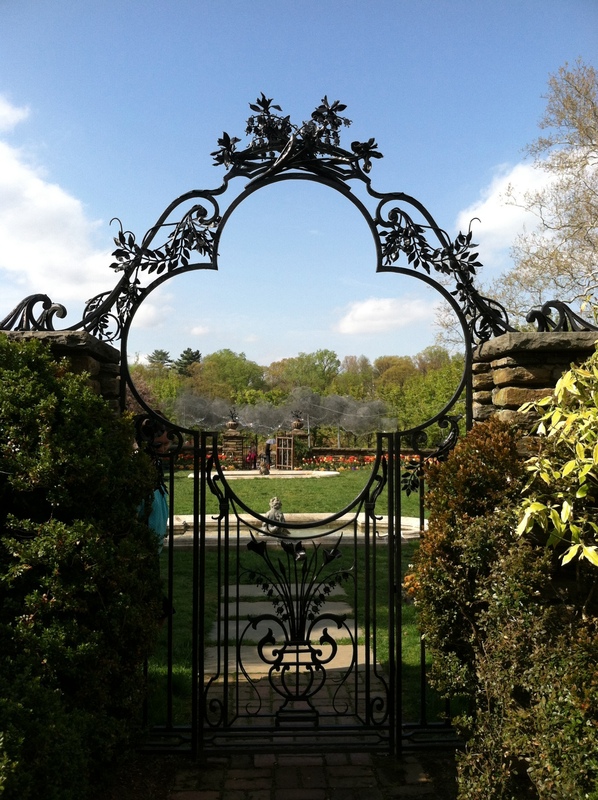 after visiting Dumbarton Oaks Gardens this week and taking some photos. 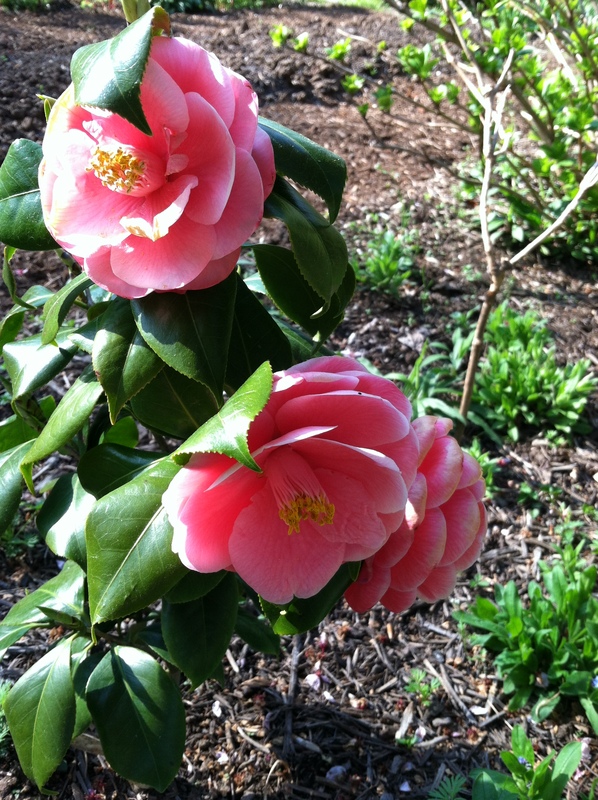 I used the camellias I photographed to make part of her gown. 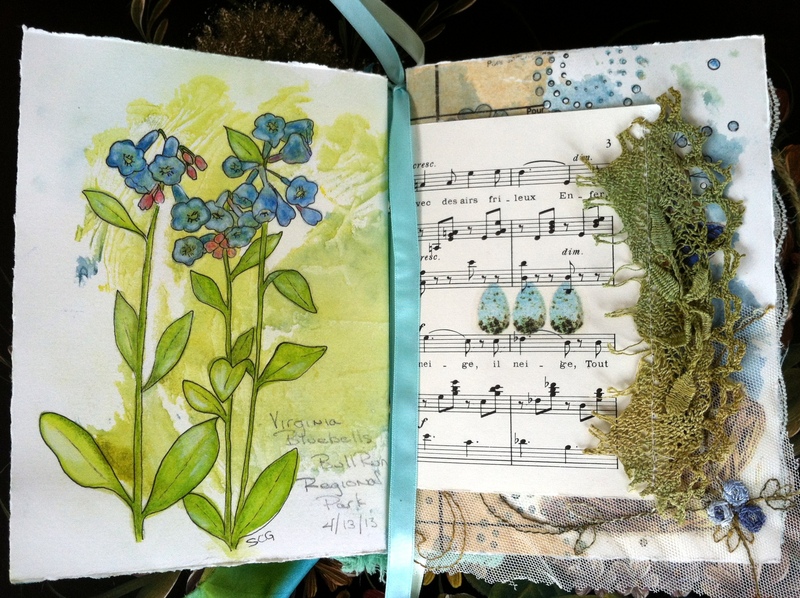 Several months ago I had collaged background paper using paper napkins, sheet music, paper towels I had cleaned up my painting surface with, cheese cloth and other various scraps. After cutting out two sections I stitched them with my sewing machine to tack down loose bits and created pockets in the cheese cloth that did not glue down well. 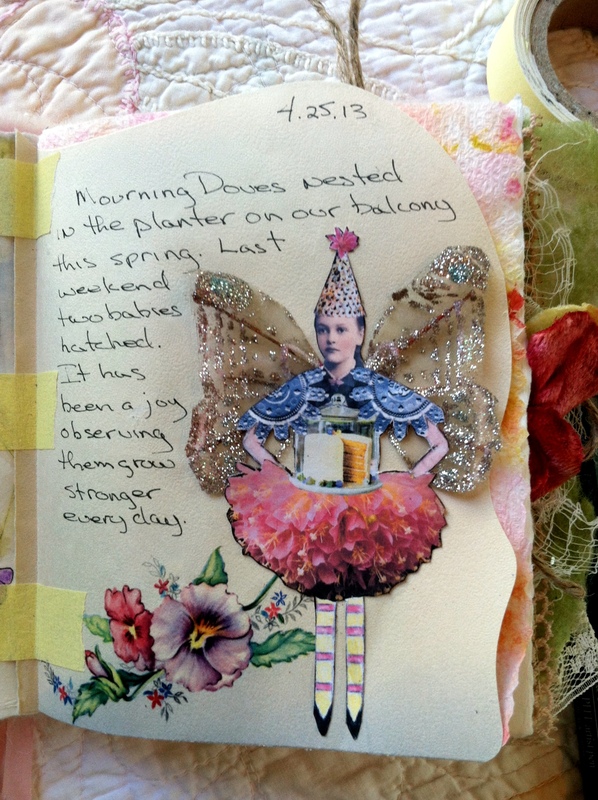 Then I glued them to my journal pages. 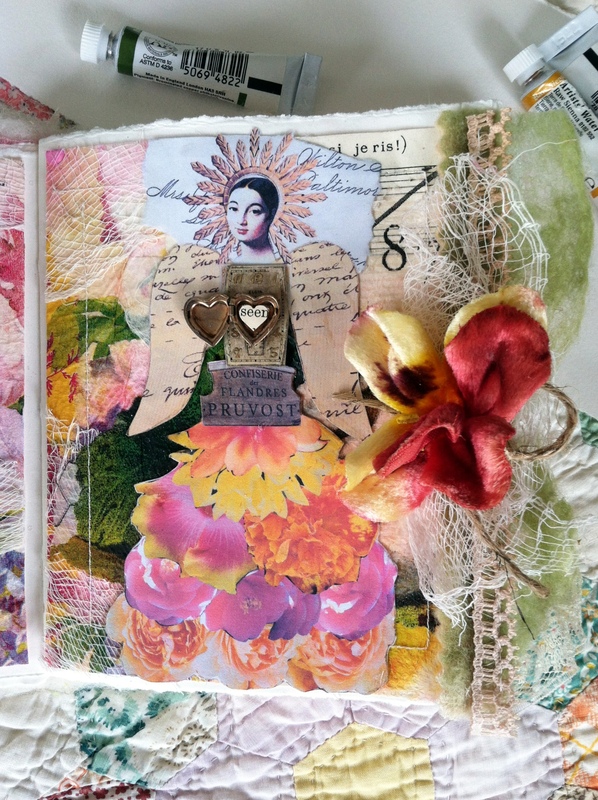 I adhered my collaged image with gel medium to the right hand page and added an old watch face topped with a vintage locket to her torso and the word “seen” cut from an old book page. 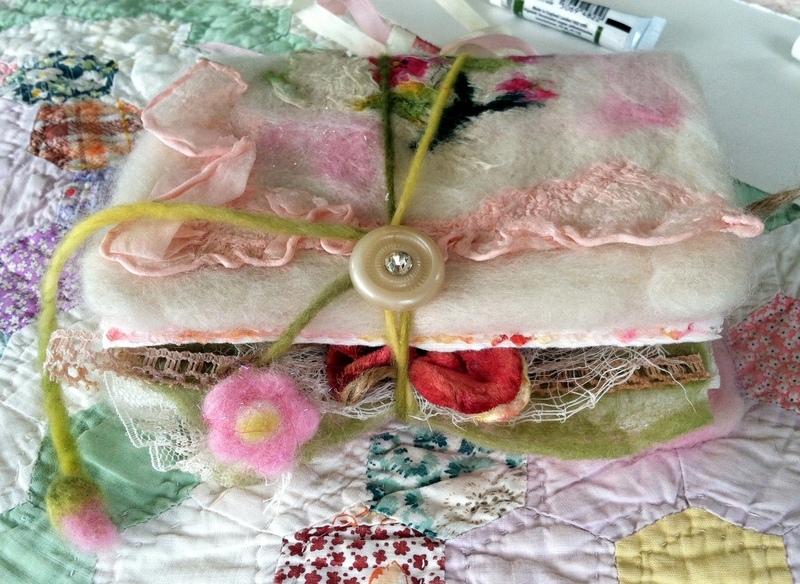 The edge of the page is trimmed with a scrap of felted wool, some lace from a friend and leftover cheesecloth, twine and a vintage velvet flower. 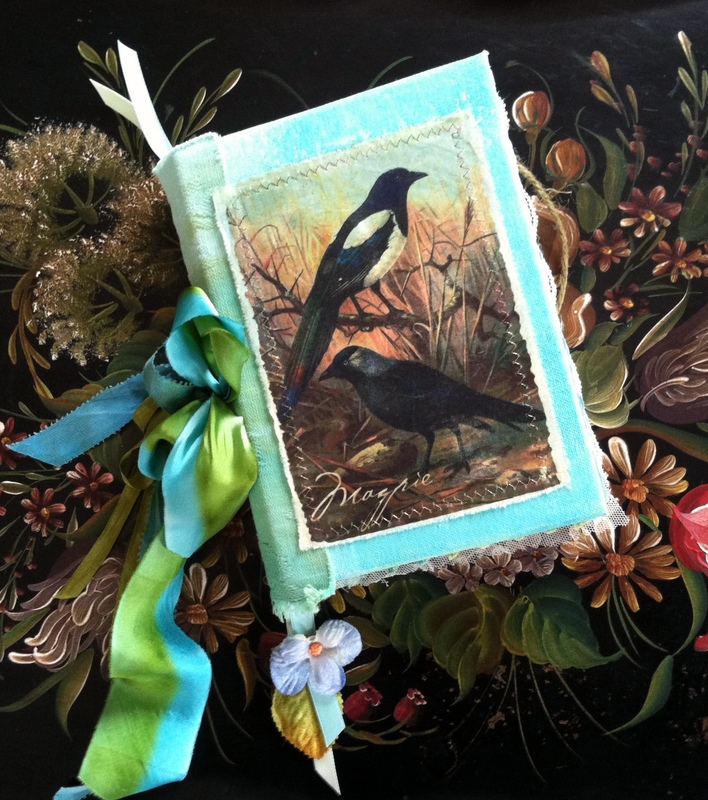 and tucked a few bird feathers I found on my daily walks in the other little pocket. Enjoy your weekend and may it be filled with art and inspiration! 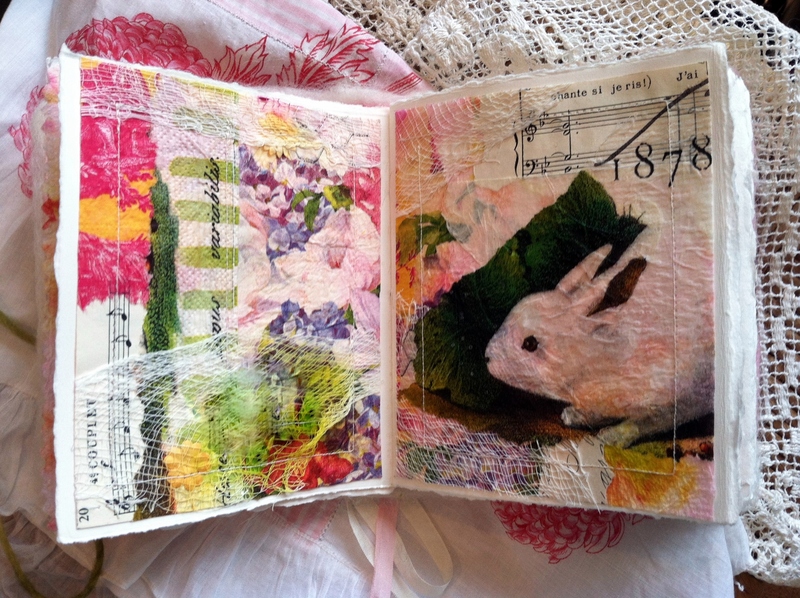 I made this journal out of canvas boards and fabric over a year ago in Lesley Riley’s class at Art and Soul and rediscovered it after organizing my art room. I still haven’t finished the cover. I was inspired to work in it last week after creating some collage images on a project day with my art group. 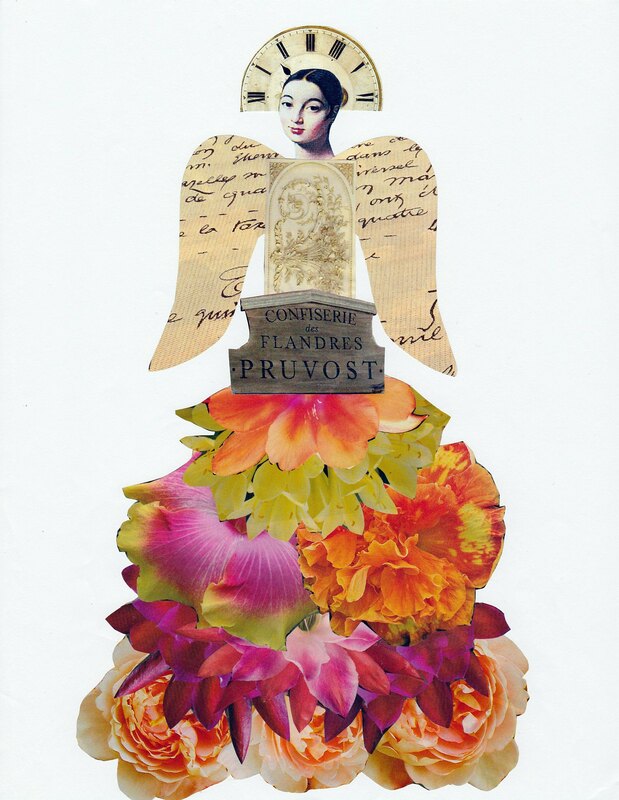 I started with the face, some were from Paper Whimsy, and then created the rest with cuttings and scraps from magazines, catalog images and bits of ephemera. 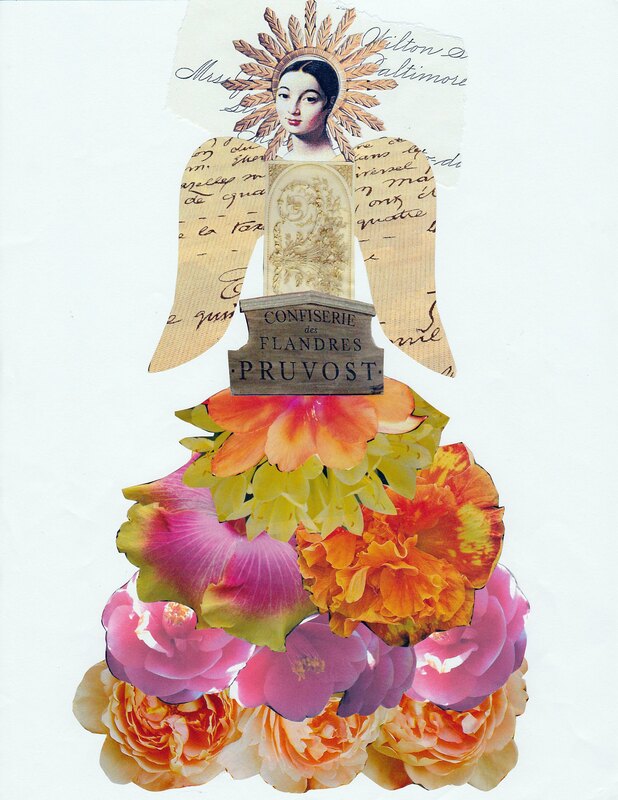 I collaged some images on background pages and sketched legs, arms and feet where needed. 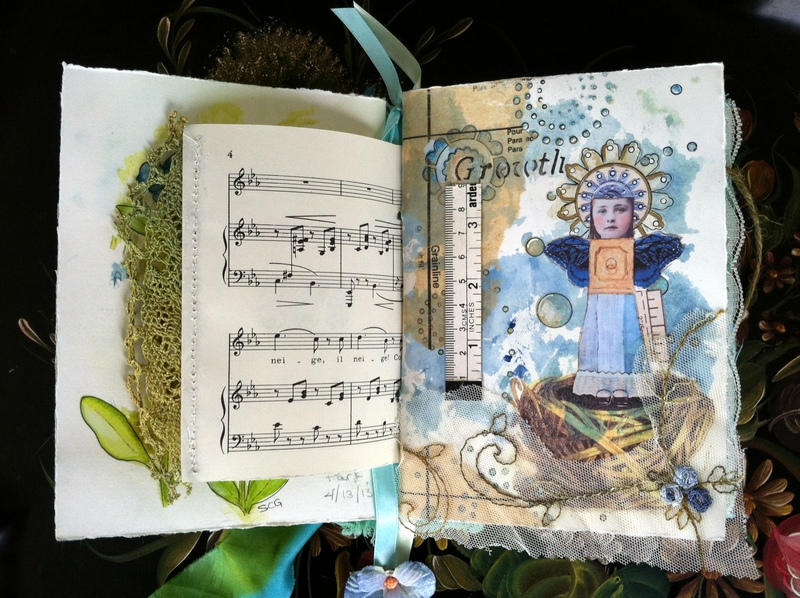 Next I applied the little blue girl image to a watercolor page in my journal with gel medium and then stenciled, doodled and added acrylic paints and white and black gel pens to the background. The nest is a TAP transfer and I layered scraps of sewing pattern tissue, a torn piece of an embroidered shower curtain from Patty and a piece of a vintage tape measure. 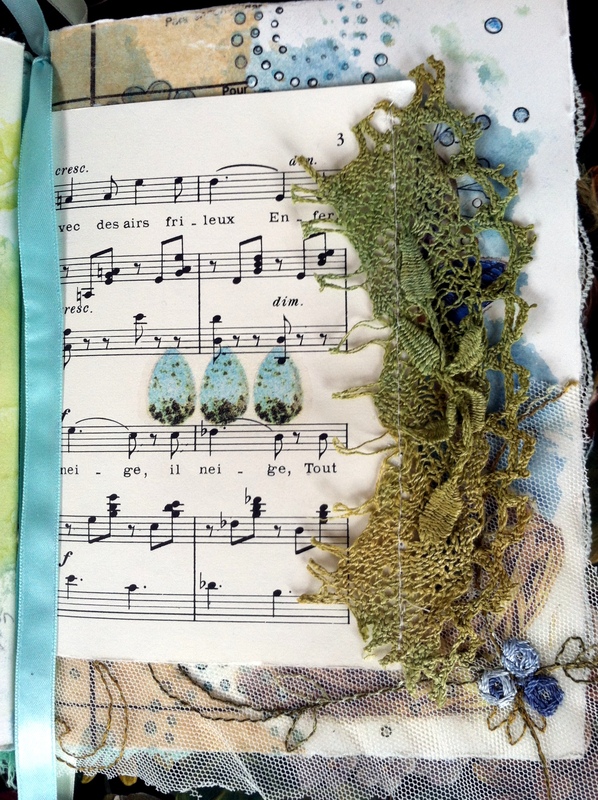 The preceding page was a small insert of sheet music on which I had done a TAP (Transfer Artist Paper) transfer of three eggs and sewed a dyed and tattered doily to the page edge. I was inspired to do a watercolor sketch of these lovely and prolific blue beauties. In my haste to get color on the page I applied too much saturation to the flowers forgetting the all important unpainted white spaces to highlight the lovely blue flowers and it all got a bit mucky. 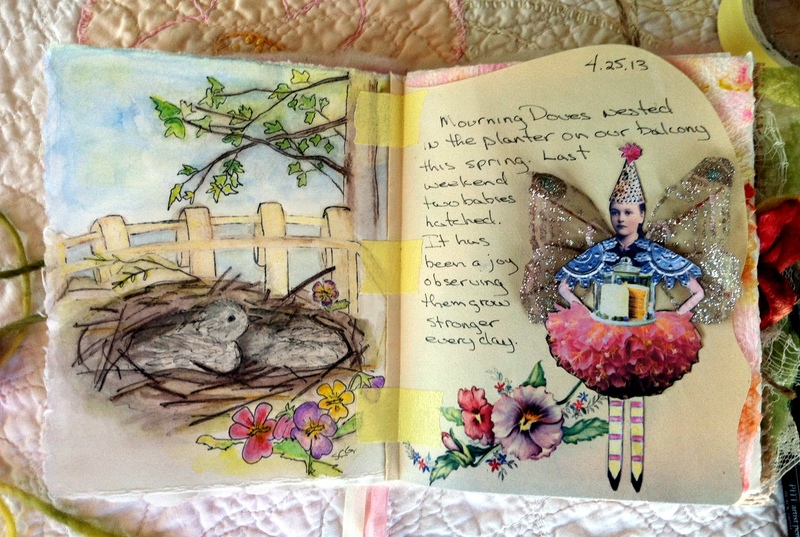 But since it’s in my journal now, hopefully I will look back and improve my next attempt at watercolor. My thoughts and prayers go out to Boston and all those involved in the horrific tragedy yesterday. Wishing peace and safety to all.